Approx. 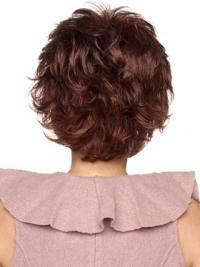 Length: Front 4.25"; Crown 4"; Side 3.5"; Nape 3.5"
I purchased this wig in the colour shown on the model. The hair is nice and thick and the cap is alittle larger than my previous wig. It fooled my family. Have been wearing my wig for a few months now...I have alopecia totalis...many people thought it was my own hair...thought I grew my hair back!!! it is wonderful ...Love it…It really come through!!!! I like the colour, length and overall quality. Great match to my colour treated blonde hair. I like to create a head band around it. This wig seems to be very comfortable. I purchased this wig in chestnut brown. I absolutely love this wig. I don't even feel the need to style it at all. It is gorgeous! Feels silky soft. Very breathable. It seems to have just the right amount of thickness. I couldn't be more thrilled with this wig! Those personal touches make a girl smile!